This is a relatively modern (20th century) two wheeled carriage, built in the gig style: that is, it seats two people facing forward, and its seat does not adjust backward or forward. It has high wheels which do a great deal to ease the bumps of travel at speed on rough roads, both for the horse and the driver. Then as now, trades-people did not want to spend all day going from place to place. Fast Hackney horses and quick stepping ponies were much in demand. 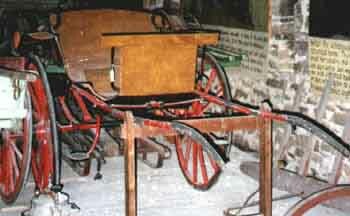 The rubber tyres on the wheel rims also tell that the carriage is relatively modern. The older style iron tyres stayed in use on heavy carts, but they were very noisy and made it hard to hold a conversation when travelling in a fast vehicle. Although it is only designed for a 13 hand pony, this is a rather masculine vehicle, probably driven by an active man who could easily get in and out. It has strongly coloured wheels, shafts and ironwork, but none of the "lining" or "striping" that would be expected on a town vehicle. The body is very plain and the dashboard has an unusually wide top rail. It was built for country use, and probably by a country carriage builder to his own pattern. The woodwork is varnished rather than painted, so it was obviously expected to take a few knocks, and not be in showroom condition all the time. The shaft leathers which protect the paintwork from rubbing by the tugs and breeching straps of the harness, are plain, not patent. The pony would be wearing brown harness similar to that in the harness cupboard, since brown harness was, again, easier to maintain in decent condition on muddy roads than the black that was expected in town. The seat is missing its cushions, which would have been of drab beige Bedford cord and the driver's seat would probably have been a slanted "wedge" which would lift him a little higher, keep his driving elbow out of the ribs of his passenger, and give him the correct position to see the road, to control his pony, and finally, to sit elegantly.